ONLYOFFICE is a project developed by IT experts from the Latvian company Ascensio System SIA. WIth ONLYOFFICE business solutions, which are the primary product range, you can run a fast and secure cloud office that comprises powerful online document editors and multiple business tools (CRM, project management, mail etc). You are also able to use the editors as a standalone application, or integrate with other solutions like cloud storage services, e.g. Nextcloud, Sharepoint, Confluence, as well as extend the functionality of the solution you’re building yourself. We recently covered ONLYOFFICE in a more detailed blog following the launch of their snap – you can read more about their capabilities here. 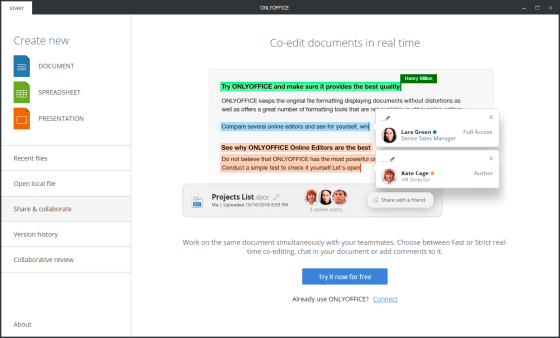 Now that the ONLYOFFICE snap has been published, we spoke to Ksenia Fedoruk and Alexey Golubev about their experience in discovering and building the snap plus how it will drive more users of ONLYOFFICE. How did you find out about snaps? And what was the appeal of snaps? Ksenia Fedoruk: We always follow the latest innovative trends in a rapidly developing IT industry, and try to implement them in our work (as it was with HTML5 and Docker containers). A while ago the growing popularity of snaps drew our attention. As our desktop editors support all popular platforms including Linux (both DEB- and RPM-based distros), we wanted to move forward in this direction. Therefore, we were searching for relevant information regarding snaps. On the Ubuntu forum we met Alan Pope, Developer Advocate at Canonical, who told us about this format and suggested that we could package our desktop editors as a snap. We took into consideration all the advantages: a self-contained universal package with seamless installation, automatic updates, ability to roll it back at any moment, and decided that we were in. We hope that packaging our desktop editors as a snap will help us push our software and all its upcoming updates straight to Linux users, earn their trust and contribute to the unification of the Linux community. Speaking of which, we have already received a few messages saying that our attention to GNU/Linux users is very much appreciated. We’re happy to hear that. How did you find the onboarding process? How easy was it to integrate with your existing infrastructure and process? Alexey Golubev: For us, one of the main advantages of the snap system was support for binary packages, as well as automated packaging process, including its integration with GitHub. That allowed us to easily package our ready-to-use application, integrate the snap in our build process, and publish it with less effort. Do you currently use the snap store as a way of distributing your software? 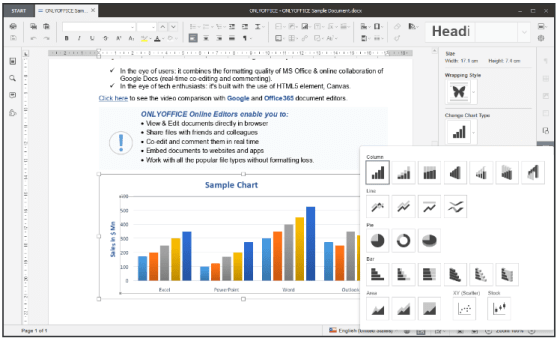 Ksenia Fedoruk: We released the snap not so long ago, and immediately informed our users that ONLYOFFICE desktop suite was then available in the Snap Store (via blog, forums, mailing and our social media accounts). Some early results are already seen: the number of downloads is growing. What’s more, we’re investigating the possibility of packaging our on-premise solution as a snap. Nevertheless, some time is needed to make an objective assessment. Alexey Golubev: We find the possibility to publish our snap in the store very appealing and useful. There is no need for developer to have their own application repository, plus users don’t need to add any third-party repositories to install apps. How would you improve the snap system? Alexey Golubev: The structure of Snap Development Documentation. Seems that it’s still underway, so sometimes it can be difficult to find the necessary info. It could be also useful to add another debugging tool to Snapcraft in addition to the existing console. After the app is launched, you need to adjust its environment, as it is different from the environment used right during the launch process. What release channels (edge/beta/candidate/stable) in the store are you using or plan to use, if any? Ksenia Fedoruk: When our snap was ready, we pushed it from the beta to the candidate channel, and “called for testing” on the forum what helped us get first feedback. It aroused much interest among users, tech bloggers and writers, who’re interested both in ONLYOFFICE and Ubuntu, their snap technology. Now our snap is available in the stable channel. What advice would you give to someone else thinking of snaps? Alexey Golubev: I would recommend that every developer, who is planning to build a snap, get a proper look through various options of snap packages on GitHub. It will help them choose the most appropriate one according to peculiarities of the product/software they’re going to deliver as a snap.